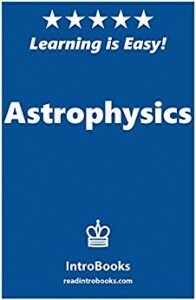 This book describes how physics and chemistry are used in process of determining nature of various astronomical objects. Celestial mechanics describes how physics is applied in order to determine the positions and motions of astronomical objects. Described studies related to large scale structures of the universe are described in physical cosmology. However, they are not a part of astrophysics. In astrophysics it is described how chemistry and physics are applied to figure out the nature of certain astronomical objects. Astrophysics is a branch of astronomy (Astronomy + Physics = Astrophysics). Various principles from physics and chemistry are described in astrophysics. These principles are useful in ascertaining the nature of heavenly bodies, instead of their positions or motion behavior.